Content. You need it; Matt Alderton can create it. Let Matt flex his creative muscles in order to bring you the dynamic, effective, engaging content that you need, one word, comma and sentence at a time. Matt specializes in writing articles for magazines, newspapers, newsletters, websites and more. If you have a story to tell, Matt can tell it. If you need words, Matt can write them. Matt offers editing services that will truly raise your game. Services include copyediting and proofreading, as well as document conceptualization and organization. Matt will edit not only your words, but also your ideas. Matt is a new-media maven. He offers copywriting services and content creation for a variety of online venues, from online magazines and e-newsletters to blogs, social media and corporate websites. Matt Alderton can help you create powerful and effective marketing communications. Services including media kits and copywriting for advertisements, blogs, banner ads, press releases, mailers and more. 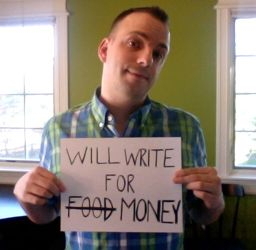 Matt knows that good writing can make or break a business. He therefore offers a full menu of corporate communications services, including newsletters, sales letters, corporate histories, annual reports, executive bios and more. Matt knows about more than words. He’s an expert on all things media, marketing and publishing. So, he can help you not only with execution, but also with conceptualization. Services include publication planning, positioning and more. After more than a decade in his profession, Matt is equipped not only to do his job — but also to teach it. Services include writing workshops, keynote speeches and editorial working groups.